Over on Orion's Arm, they put out a very cool article on gravity balloons (link also in sidebar nav now). In the process, they just happened to propose a new construction method as well. I had not gone this direction because I thought the asteroid in-situ use is critical for nearest-term viability because it avoids large material movement. That assumption, like all others, can change depending on unknown future capabilities. Not only is the method possible, it's actually more material efficient due to a roughly 2/3rds power scaling benefit due to decreasing the surface area to volume ratio. In other words, it lets you combine smaller asteroids into one colony which will be more mass-efficient than any of the individual asteroids alone. Also, there is some amazing eye candy far beyond anything in this blog. The things which look like sesame seeds are broken pieces of asteroids. The balloon is a membrane with a small pressure tolerance, and those rocks are placed (or sprinkled) on evenly so that the pressure is increased through mutual gravitation. The red thing is a specific radiator design. Some specific constraints on how you can move the rock material will come up with this method. However, I see two competing frameworks for developing a model. One fundamental constraint would be to avoid any angles larger than the tumbling angle for rocks. Another constraint is that your material strength must be enough to support some curvature due to ballooning out between the rocks. You could use any Platonic solid to create a model of this, although I would prefer to just start with a tetrahedron. Also, I'm not sure if the balloon should be considered to have some linear mass, or the rock placement should form some kind of regular summation. There could be some similarities to the rockfill problem I wrote about, but with even more potential directions. I don't think this would be an easy problem, but that depends on the approach and how the math turns out. If you consider the balance between the membrane's material strength and the number of trips needed to add the rocks, that forms a very coherent mathematical problem and I would love to have a crack at it sometime. Interesting to see some if your consept. I too am writing a blog at beuceskillicorn.blogspot.com I am trying to work out how it could be feasible. I have come up with some co septs and drawings. ... 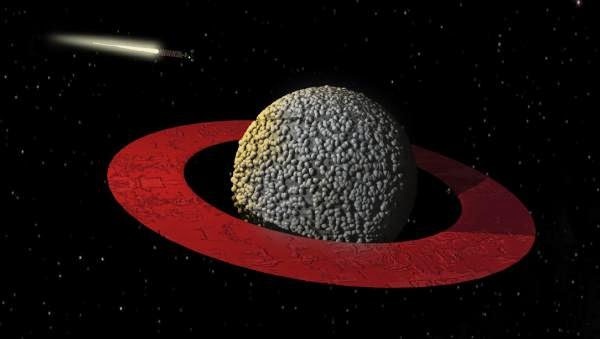 I am also working on writing about how society would work in a free floating city state of 500 m x 2000 m drums rotating at 1.9 rpm ... the 3000 years ib the future about 20,000 AU out in the oort cloud. social structure is very chalenging.